Click for more information and colors!! If you are looking to reduce the cost per foot for Siser Easyweed consider buying in bulk – purchase rolls vs sheets. ?For the small crafter this may seem daunting but, considering how you may save over time, rolls are definitely a more cost effective option! ?Rolls also allow you to be more flexible in cutting for specific jobs and they store much better than sheets! World Weidner offers a selection of colors for you to purchase in 3ft, 5ft and 10ft rolls. ?Pricing starts from around $29.99 for 10ft rolls! Come visit us on Facebook, our store is now live! Come and say Hi, ask a question or need a recommendation? We’re here on Facebook!! Like our page and share with your fellow crafters!! So Cricut announced this week the soft launch of their new Design Space 3. Cricut users have long suffered a multitude of issues with their online based design software. The main issues stem from the platform the design software was written on – Adobe Flash. The software has been notorious within the crafting groups for untold headaches and reliability issues with many people complaining and also defecting to the Silhouette Cameo platform which has offline computer-based software rather than an online solution. Cricut has recognized these performance and stability issues and has addressed them with a complete rewrite of Design Space using the latest web development platforms giving their users a fresh new look and the performance and stability everyone wants and needs to run their crafting businesses. The new platform does not boast a whole load of new features, I believe these will come in time. Cricut when announcing their new version put out the system requirements. They state that Windows 8 and higher will be able to run the new Design Space 3. This has put many people into panic mode as there are many that have not transitioned from Windows 7, some are still on older versions of Windows. Many fear to upgrade due to bad press or bad experiences with some Windows 10 upgrades, others simply don’t want to change. Microsoft now also charges for Windows 10 upgrades after the initial free upgrade period BUT you can still upgrade to Windows 10 for free via a special link on Microsoft’s accessibility site – see here. This will help you if you are running Windows 7 or higher. XP or Vista users, sorry you are out of luck and most likely your hardware is probably below today’s standards anyways! As far as Design Space 3 goes you can still use Windows 7 to run your Cricut. Issues that may occur are probably due to old versions of Internet Explorer that you may have installed. a) Run and install all of your Windows updates and ensure you have the latest Internet Explorer. b) Download Google Chrome, Mozilla Firefox or Apple’s Safari and use a more up to date and secure browser for all of your surfing needs. There is also a Feedback link in the new Design Space 3 – use this to send your thoughts and experiences to Cricut and help push for new features you would like to see as well as any problems you experience on the new platform. If you have ever heat pressed bags, Onesies or other items that have a raised,?stitched seam or recessed area you have probably found that your vinyl may not have bonded properly and lifted or not peeled properly after pressing. The issue is that the heat press platen is not fully coming into contact with the vinyl and onesie.? To get a proper press you will need to raise the lower portion of the garment or bag to ensure you have proper heat and pressure against the press. The solution to this problem is a teflon pillow.? Putting this under or in the item to be pressed helps raise the target surface so that your heat press comes into contact with the vinyl as needed. Teflon pillows comes in various sizes and prices start from around $10. (Using a towel or wash cloth under the surface also works as a temporary fix but use teflon pillows that will last you in the long term and provide the best heat transfer to ensure the best bonding of your HTV. What is the best budget heat press? One of the most Googled questions in the crafting and vinyl communities. The best budget heat press depends on your wallet and heat pressing needs! We breakdown a number of options to give you a heat press to meet both your needs and your budget! There are a ton of cheap heat presses and they come with many challenges and faults. Starting out as a small business or a hobby crafter you can look to spend around $200 on your first press unless you are going to invest early towards making a business. Avoid the cheap deals and the too good to be true options that you will find on eBay. Look for returns conditions and ensure that the company will offer returns including shipping. Heat presses are extremely heavy and large and that makes them a very awkward and expensive shipping ordeal if you have an issue. Ensure you have a warranty, if possible extend your warranty to keep your investment covered. Check reviews and if you are a member of the crafting community on Facebook ask around and get recommendations and feedback! The Powerpress offers the best bang for buck! It is a 15″x15″ clamshell press that comes in at just over $200. It is available on Amazon and is their Best Seller press with incredible reviews. It is one of the most purchased presses within the Facebook crafting communities and you can get plenty of feedback within the Cricut and Silhouette Cameo groups. You can purchase a 2 year extended warranty from SquareTrade via Amazon for under $20. This press is excellent value for money and the best in the budget/starter press range if you are looking for a clamshell press. Swing away presses offer the same functionality as the clamshell but offer the advantage of having the heat source on a swivel so that you can swing it away from the base allowing you to work on your design before and after pressing. The disadvantage of the swing away vs. the clamshell press is that the swing arm requires more space to function. Check out the Powerpress and Zeny options, they offer both 15″x15″ and 16″x20″ options. If you are looking for a swing away / multi-function press there are a couple of options available to you. 5 in 1 swing away heat presses. You will notice with the swing away presses that the platten tends to be a smaller 12″x15″ surface vs. the clamshell presses which mainly come in 15″x15″ form factor. The swing away presses come with the various attachments for hats, plates and mugs. These attachments simply unscrew and screw in place. The top heat plate is also held in with screws which simply loosen and allow you to swap out once cooled off. The base also slides out so you can switch out for the hat/plate bases. Visit our Store and check out all of the heat press deals on offer to suit all budget types. We also have Heat Transfer Vinyl (HTV) as well as recommended accessories to help you with your pressing needs. 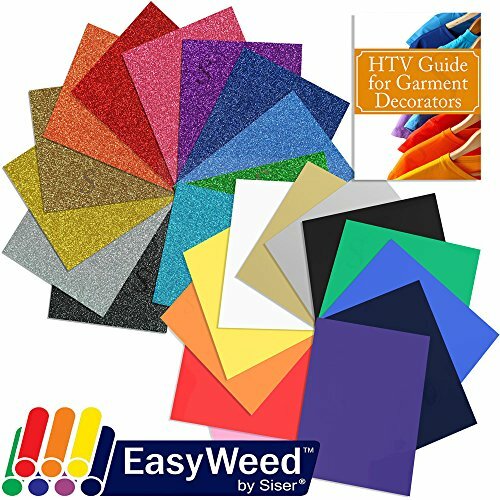 One of the most commonly asked questions is how can I apply HTV with an iron? Not everyone has or wants a heat press. ?For casual designers an iron will work BUT be prepared to apply a lot of pressure to get good lasting results! Siser created the video below as a guide on how to apply heat transfer vinyl using an iron. Look to protect your designs too whether you use an iron or a heat press – invest in some teflon sheets to cover your design as you press, especially when you are doing layered designs. If you are interested in a faster and more professional result look into heat presses if you plan to sell or press any number of shirts. Check out our guide on heat presses here!